2014 Magna Mater, Sauvignon Blanc, Vogelzang Vineyard, Santa Ynez Valley. The beautiful and beguiling Sauvignon Blanc, from the very talented Jordan Fiorentini, the winemaker at one of California’s brightest Rhone style producers, Epoch Estate in Paso Robles and who used to work with Justin Smith, of Saxum fame, is a wine you should look for, it is a complete and joyful white that is pure quality in the glass. Fiorentini, who cut her teeth as head of winemaking at Sonoma’s Chalk Hill, has made many impressive and critically acclaimed wines, so it was no surprise to find her personal label Magna Mater a fine and expressive effort, but because I’m quite jaded when it comes to Sauvignon Blanc it was a little bit of a shock to find myself adoring this one as much as I do. Honestly I don’t get all that excited about Sauvignon Blanc from California, but this is an exception and a really fun wine, I found myself going back in time to the early years of Brander, the Santa Ynez Sauvignon Blanc pioneer, when my mind was blown that Santa Barbara County was a place that could produce sublime Sauvignon Blanc with either Loire like raciness or Graves like richness, and Fiorentini’s Magna Mater Vogelzang again proves the point, with the idea combination of both mineral driven energy and textual pleasure on the palate, this vibrant Sauvignon really stands out in a crowd and deserves real kudos. 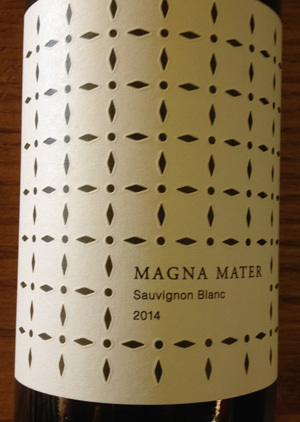 The 2014 Magna Mater Vogelzang starts with bright lemon/lime, white flowers, kiwi and a steely rail that runs the length of this intriguing white along with wild peach, tangy quince, liquid stone, verbena, saline and basil/herb notes. This is vivid and mouth-watering stuff that gains weight or gravitas with air, but stays vigorous, dusty dry and crisply focused throughout, this is a very polished and poised offering and I can’t wait to see what other interesting wines take shape under this new label, drink this over the next 2 or 3 years.